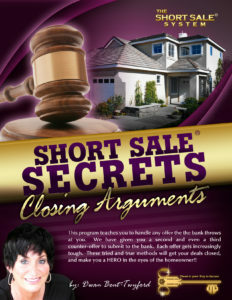 If you’re not doing short sales right now you’re walking away from thousands of dollars! *** BONUS SESSION: GET A FREE ONE HOUR MICRO-MARKET ANALYSIS. WE WILL SPEND ONE HOUR WITH YOU ON A “SCREEN SHARE” AND SHOW YOU THE EXACT NEIGHBORHOODS TO WORK, WHERE TO STEER CLEAR, AND TO SEE IF YOUR MARKET IS GOING UP OR DOWN. Once you “HEAR” about a market change – you have already missed it. We can predict SIX FULL MONTHS ahead of ANY market shift. Be one of the first 27 for this BONUS that you cant find any other place! ONLY FOR THE FIRST 27 PEOPLE!